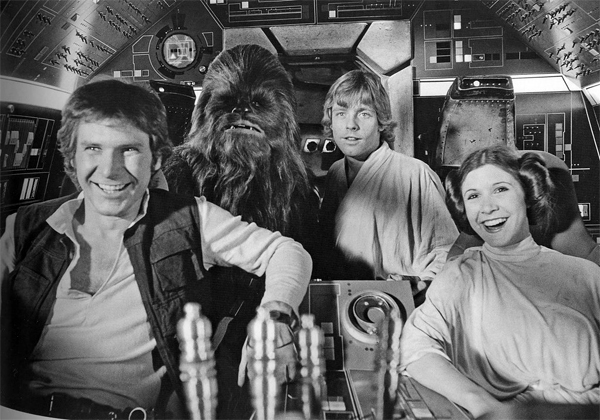 Being Retro: HAN SOLO, SHOULD WE BE LAUGHING... EVERYTHING HAS CHANGED! HAN SOLO, SHOULD WE BE LAUGHING... EVERYTHING HAS CHANGED! Han Solo is a fictional character in the Star Wars franchise, portrayed in films by Harrison Ford. In the original film trilogy, Han and his co-pilot, Chewbacca, become involved in the Rebel Alliance which opposes the Galactic Empire. During the course of the Star Wars story, he becomes a chief figure in the Alliance and succeeding galactic governments. Star Wars creator George Lucas described the character as "a loner who realizes the importance of being part of a group and helping for the common good". I am not laughing... well, nope not laughing.. I remember the good old days when, Chewie didn't have such a face-lift!